Here’s a great recipe for you! It’s healthy and refreshing – and uses only THREE ingredients. Place pineapple into a food processor and puree. 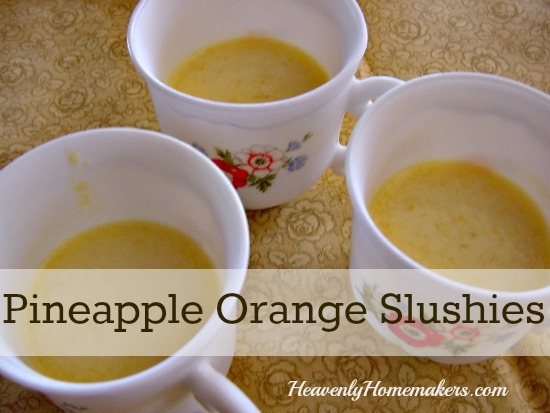 Pour orange juice and yogurt into food processor and blend together with pineapple. Pour mixture into small serving dishes. Place dishes in the freezer for about two hours to become slushy. These are a great side dish at lunch or afternoon snack! Take a peek at other Fruits and Veggie recipes and encouragement here! Sounds refreshing. Can you also use canned pineapple? That sounds so yummy. Perfect for spring and summer time! To answer Lyn’s question…yes you can use canned pineapple. I just LOVE fresh pineapple because it is SOOOO sweet!! Ooh, yummy. I’m sure we’ll enjoy these. The kids love slushies. I will have to try this. I love to freeze pineapple and use it in smoothies. This would be a good way to use pineapple too. I will have to try this. Thanks for sharing. Oh, I think my girls would love these! They sound perfect for a hot summer afternoon! I look forward to pairing this with some meals…perhaps next week’s. So many fun was to get my fruit. try freezing your oranges and pineapple bits….blend on high with a scoop of yoghurt. Great for hot summers! !